Groups for kids and adults. Kid’s groups mid-September to mid-April for grades 1-4 from 6:30-7:45 pm. Let’s learn together! Women of ALL ages and walks of life are welcome to attend our Women’s studies. 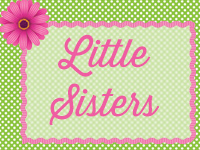 Little Sisters is a mentoring program for girls in 1st-4th grade that meets at 6:30-7:45pm in Room 320.